Morph Megadrive is a new pre training formula from isatori designed to give you focus and long lasting energy during your workouts. Winners!!! the winner of the Morph Megadrive pack is Ness Lawgun. And the distributors would also like to give Andrew Barrett an 'Assault' pre workout formula as a consolation prize. All the other entries will get sample tablets of the Morph GXR-3 tablets. The first time I tried Morph Megadrive I thought 'wow that's sweet! ', so if you like sweet then you're going to love this one. Its an aniseed flavour which is fine but the added sweetness was abit too much for me so at my next workout I added more water which made it much better. 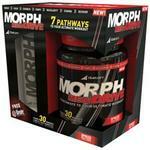 I took the Morph Megadrive for a week and found that it gave me a good overall energy and strength but not the 'mental kick' like some other pre workout formulas. Might be a good thing as you're not hyped up so you're not all anxious for your training session. I would say I'd need to take it on a longer term to see how it would increase my strength and overall muscle mass. Hopefully our Morph Megadrive winner Ness will give us a better idea after she's used all her container. This isn't your classic protein bar that's all chocolate coated and is all chewy in your mouth. As the bar doesn't contain all the fillers that many other bars have, this bar is best described like a crunchy doughy and you probably need a glass of protein shake with it to help you wash the bar down. Some people don't like that type of texture but I'm actually ok with it. The bar contains lots of ground up almonds and nutty in taste. Its not overly sweet and is quite satisfying without getting the sugar high of some bars. Since the bar is wheat, gluten and dairy free, I didn't experience any adverse affects from it as I am lactose intolerant ie puffy eyes, running nose etc. One advantage to the Purefit bars is that they don't melt in your bag, although it did take a mouthful or two to get over the fact that this was a protein bar without chocolate! I liked the taste and the texture; my husband and I both agreed it tasted like raw biscuit dough, got to be a plus. A drink would help it go down more easily and they reminded me of a type bar you would take on a ong bike ride as they wouldn't break up and it wouldn't matter if they got squashed in the back of your cycling gear. I would buy these bars to use as a snack. Loved it! Stoked there's now a gluten free protein bar and will definately look to purchase these. Loved the taste and texture. It was creamy with crunchy bits in it, like cookies and cream. Very satisfying at 200 Cal and excellent protein value at 18g. Thanks for the opportunity to try the new granola crunch purefit bar. I really enjoyed it, I thought it was not too sweet or chewy as some of the bars are. It left a pleasant taste in my mouth and I would definitely buy again. Thoroughly enjoyed the bar. I have to admit tho, the first couple of bites took me by surprise (just used to other bars!) but I actually enjoyed it! It was very fulling - felt very satisfied and was looking forward to the next one. Great to see a tasty protein bar that is available to those that are gluten & lactose intolerent! Excellent! The bar was quite nice, I had to divide it up into 3 to snack on with my mid-morning meal as I was a little paranoid of the sugars this far out from a comp. It has a good taste and not that taste you usually get from protein bars, probably a bit sweet for me however. It tastes like a nice muesli bar but with the added bonus of 18g of protein. Good for those people who are after a mid morning meal replacement and don't usually enjoy the taste of usual protein bars. I wasn't effected by the usual "sugar alcohol" bloat I often get as I don't think they use much of that stuff. Great bar for most. The designer protein bar! They are sweetened with Algave Nectar, which is a natural low GI sweetener, this means they are won't spike your sugar levels like glucose and also don't contain artificial sweeteners. The ingredients are vegan and do not contain wheat, dairy or gluten which means no digestive disruptions! This flavour tastes yummy also, reminded me of cookie dough! Finally.........................a chance to sit down with a coffee, some silence and time to savour the Purefit bar that has been rattling around in my bag waiting for this opportune moment!! Ummmmmm, have to say I'm a chocolate/sweet/gooey kinda bar snacker. I tried to REALLY like it but apart from the fact I could pretend I was eating uncooked home baking (yummmmm), I struggled a little with it. Certainly not unpleasant or artificial tasting as a lot of bars can be but not my kinda flavour! Some of you may have seen some of your gym buddies wearing bands around their wrists and wondered what they are. Tony Ligaliga was wearing a very colourful red one at the gym the other day and he said it was a magnetic band which helped him with recovery and strength. And I thought 'yeah right'! I'm such a cynic. Then in a coincedence I had a friend bringme a gift from a trip to the Phillipines last week, and it was a magnetic band. Go Figure! They also brought me a band that goes around the neck which I'll pass on to a client to use and see if it makes any difference. The magnetic bands have been around a few months but I never really took much notice of them, afterall how can a band help to promote recovery and increase strength. Just on the radio today, happen to listen to Murray Deaker's talkback and he loves biomag, anyway the lady advertising the biomag blanket is also giving away a magnetic band to put on the wrist. They say thousands of people have felt better and their back aches have gone from sleeping on the blanket, so maybe a wristband will help in daily life. Who knows? So, I'm going to be wearing this band for a week and see how I feel. At the moment I'm feeling very achy and have sore joints, probably from all my weight training and cardioing, so going to see the band helps me recover. 22 March Verdict: Well I've had the band on my wrist for about 2 weeks now and my verdict is - its all hype! infact its made my elbow joints feel more sore and achy. Maybe others have had better expeirences with it on but since taking it off my elbows feel so much better. Some of these bands cost upwards of $80 so its pretty expensive for a gimmick, lucky I didn't pay for mine other wise its would've been a big waste. I'm not one to wear anything too tight. Too high cut. Or too low cut for that matter ha ha. But when it comes to finding ways to improve my fitness or recovery, I'm willing to put myself beyond my carefree comfort zone and trial something new. Since Skins have been the innovators in compression wear technology which aims to enhance performance and recovery, I thought it about time to see what all the fuss is about. Back in June 09 I went to a very secret squirrel pre launch of the Skins A400 series to retailers. So hush hush, I wasn't even allowed to take any photos as they wanted to keep their new technology super secret. Skins range has been designed for men and women incorporates long and short tights, long and short sleeve tops. Plus they are also bringing out a recovery range. Now the secret is out. The new range will soon hit the stores but I have had a pre trial of the new skins for the past week and its been great. The immediate difference you'll see with skins is the colour. Gone is the blue with yellow trim. They've selected the slinkier black colour with discrete Skins signage. The A400 series was named because of the way they drew data to produce the new range. In a very thorough research programme, Skins took 3D bodyscans from 100s of men and women, and took data from 800 000 points on each person. From there they used 400 key points from each body to decide where the best points of compression are to enhance sports performance and recovery. What I am here to tell you is how it feels to wear the long tights. If you already wear skins, you'll already know that as soon as you put it on you feel tingly as you the blood flow through your legs. The thing about Skins is that you get to see all your curves (and er bulges.. yay! ), so what better motivation to get going! I did biking the first day and it felt great, particularly around the knee area. As I have a bit of wonky left knee, I felt more support of the reinforced band which runs along the Illiotibial ban. This design not only give support to the Iliotibial band but also supports the natural rotation of the knee. During the bike I felt more streamlined, I guess from all the compression, and felt I had more energy. Perhaps its psychological. But if it works and helps me to feel better for longer then great! I think the main benefit of the Skins for me is when I do leg training. I did quite a challenging leg day which included Leg extensions, hack squats, lunges and deadlifts. I found the extra support from the band kept my knee in place and I felt more cofident doing putting little bit more weight on the machines. Usually my legs would be feeling quite sluggish by the end of the day but after this day that I wore skins, my legs were still feeling relatively pain free and have energy for cardio later on. However, I did feel bit hot wearing the skins while training. I realize the aim of skins is to enhance bloodflow and enhance lactic acid movement out of muscles but I was feeling super hot and sweaty that day. Then again, it could've been the humid hot weather we're having. I know alot of people who swear by Skins. Tony Ligaliga always wears them during his leg training and cardio. Others I know wear them everyday underneath their clothes even on non training days. Some even wear them to bed! Not sure if I'll get that obsessive with them but I know Skins will certainly feature more in my training and cardio sessions. Balance's new tropical fruit punch was quite nice and refreshing. I mixed the WPI powder with water and it tasted similar to orange juice but not too tangy. Actually the taste had a base of orange but after a few sips you could taste the banana, and then a hint of pineapple in the shake. I'd probably have this more as an afternoon shake as it is a refreshing flavour and keep the chocolate for after workouts. My christmas came a week early in 2009 when I got some delicious samples of the New Lite n Lean Salad range from Fresh 2 Go. So now that Christmas is over and many of you are in the right frame of mind to eat clean, and perhaps even going on a diet in the new year, I'll tell you about the new salad range for you to consider. The 7 salads were neatly packed in their own containers and I must say each of them looked very cute as they all had their own compartments to keep the different foods separted. Each of the packets also had a plastic seal which helped keep everything fresh too. My reviews of the salads are below. Generally I think the salads would be ideal for the corporate office worker who hasn't got the time to be making food themselves and find the convenience of ordering a week's worth of salad a timesaver for them. Personally I'd prefer the chicken options of these salads as I found the vegetarian options didn't quite fill me up or contained enough protein. The salads and vegetables were very fresh and I enjoyed seeing the different colours in the containers. Some of the salads would probably just be a snack for me at morning or afternoon tea (does that mean I'm a guts?!!) as it wasn't filling enough.